New county officials took the first step toward bringing their campaign promises to life by taking the oath of office Tuesday morning at the La Plata County Courthouse. Before taking the helm, the newly elected officials, Sheriff Sean Smith, County Commissioner Brad Blake and Treasurer Allison Morrissey brushed up on their statutes, responsibilities and potential liability. While preparing to replace former sheriff Duke Schirard, Smith spent two weeks at a state-required training in a suburb of Denver with the 27 other newly elected sheriffs. This principle falls in line with Smith’s vision for the agency. He plans to establish a management-review team to make sure all department employees are assigned properly. For example, the department may consider adding school-resource deputies, and it will examine how many people are needed to staff the jail. He has been meeting with each one of his new employees one-on-one to find out what has worked well and what needs to be changed. At training, Smith also had the chance to plan for the future with the three other new sheriffs in Archuleta, Montezuma and San Juan counties. The four lawmen discussed working together to fight wildfires and other issues. “It will be interesting to see what we can build,” Smith said. In addition, the sheriffs at the training discussed how community policing can avoid the situation that played out in Ferguson, Missouri, last August when a police officer shot an unarmed black teenager, leading to large public protests. Smith hopes to build a relationship of trust with the community, and he has reached out to the Southern Ute Indian Tribe to bridge some gaps that may exist. Blake, the new county commissioner, is also getting schooled on dealing with issues ranging from managing road and bridge maintenance to human services. He plans to leave Wednesday for his second round of classes hosted by Colorado Counties, Inc. The organization also helps prepare commissioners to deal with hot topics in the Legislature. For Blake, water policy stands out as a top state priority where local governments should have a say. “I think water is going to be a huge issue, not only for La Plata County, but the state of Colorado,” he said. Locally, he is going to be focused on making the county more business-friendly and working to streamline the permitting process for construction and other business activities. “Planning is where I think a lot of things get stalled,” he said. Right now, receiving permits through the county can sometimes take nine months to two years, county Treasurer Allison Morrissey said. The newly elected treasurer is also working on ways to make the county’s planning and treasurer’s departments more efficient. Morrissey officially started work Jan. 1, and immediately had to start making decisions about the county’s investments, she said. She is applying her 25 years of experience in big business to her new job. But she also became a certified treasury professional before she ran for office so she would be prepared to manage the county’s money. Clerk and Recorder Tiffany Parker, Surveyor Lawrence Connolly and Assessor Craig Larson were all re-elected in November, and they also took their oaths Tuesday with their colleagues. Coroner Jann Smith, who was appointed to office previously, also started a fresh term. A few of these department heads have plans in motion to improve services in the new year. The assessor’s office is going to be gathering fresh imagery of the county in the spring that will help the department assess property for tax purposes, Larson said. Parker will be serving as president of the Colorado County Clerk Association, and she will monitor how new state legislation effects county clerks and the public statewide. She also plans to continue improving the county’s online property records database that includes deeds, mortgages and plats. “We want to make sure our database is really clean,” she said. This story has been corrected to say the assessor’s office will be gathering fresh imagery. Allison Morrissey is sworn in as La Plata County Treasurer by judge Jeffrey R. Wilson Tuesday morning. 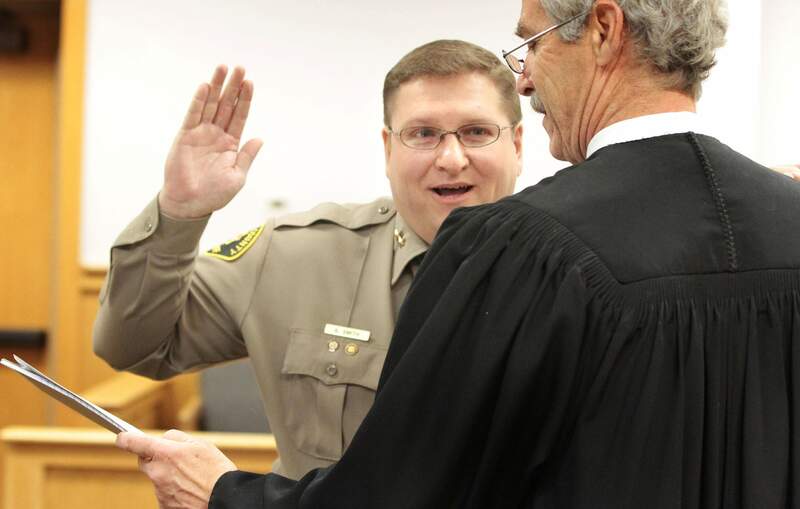 In front of a nearly packed courtroom, Sean Smith is sworn in as La Plata County Sheriff Tuesday morning by judge Jeffrey R. Wilson. Tiffany Parker is sworn in as La Plata County County Clerk and Recorder Tuesday morning by judge Jeffrey R. Wilson. 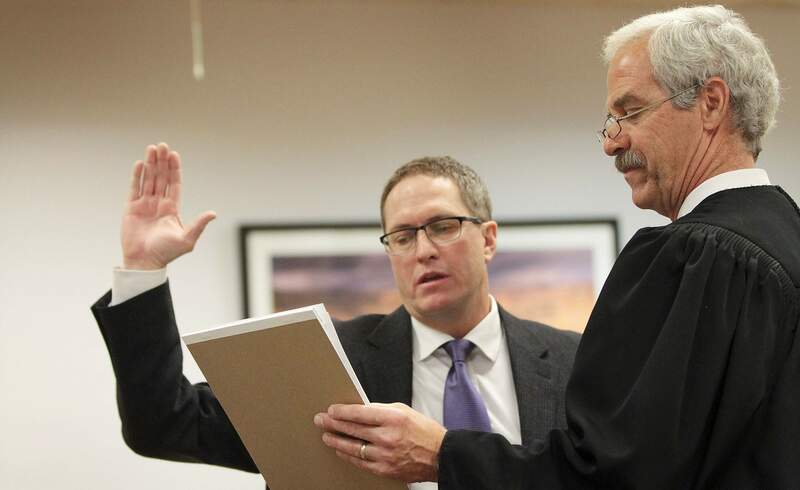 Lawrence T. Connolly is sworn into office Tuesday as La Plata County County Surveyor by judge Jeffrey R. Wilson. Janis Smith is sworn in as La Plata County Coroner by judge Jeffrey R. Wilson Tuesday morning. Craig Larson is sworn into office Tuesday as La Plata County Assessor by judge Jeffrey R. Wilson. Traci Smith, left, hugs her husband Sean Smith after he was sworn in as La Plata County Sheriff Tuesday morning by judge Jeffrey R. Wilson. Brad Blake, left, is sworn in as a La Plata County commissioner Tuesday morning by judge Jeffrey R. Wilson. Craig Larson s sworn into office Tuesday as La Plata County Assessor by judge Jeffrey R. Wilson. Newly sworn in La Plata County Sheriff Sean Smith swears in deputies and civilians in mass at the Sheriff’s department Tuesday afternoon. In front of a nearly packed courtroom, District Judge Jeffrey Wilson swears in Sean Smith as La Plata County sheriff on Tuesday. Smith just returned from training on the Front Range, where he was able to plan for the future with the new sheriffs in Archuleta, Montezuma and San Juan counties. Brad Blake, left, is sworn in as a La Plata County commissioner Tuesday morning by District Judge Jeffrey R. Wilson.